It's about time! 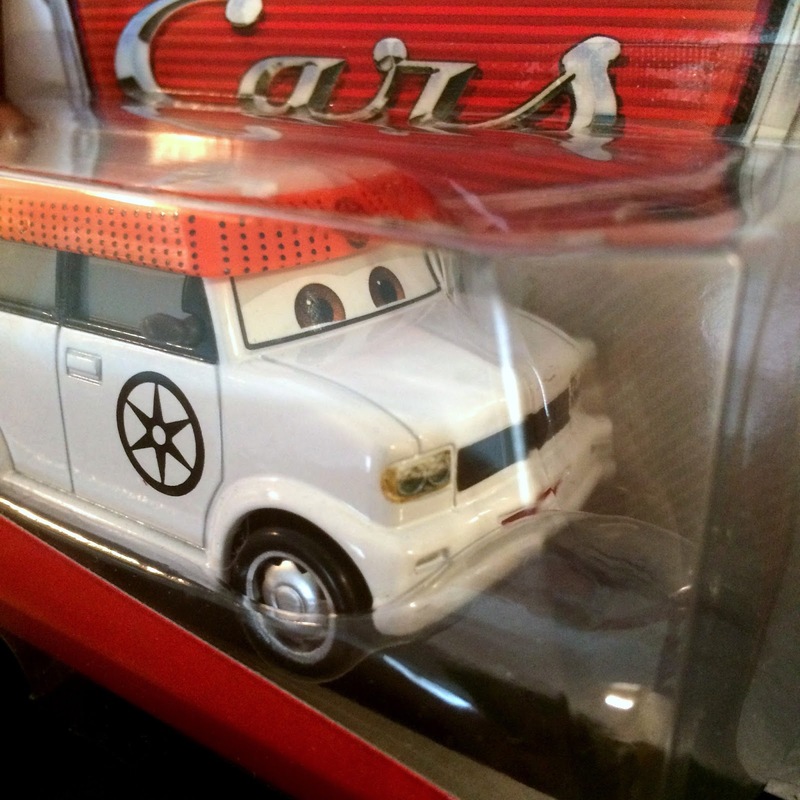 After quite a few years, the very rare Disney·Pixar Cars Frank diecast has finally been re-released. 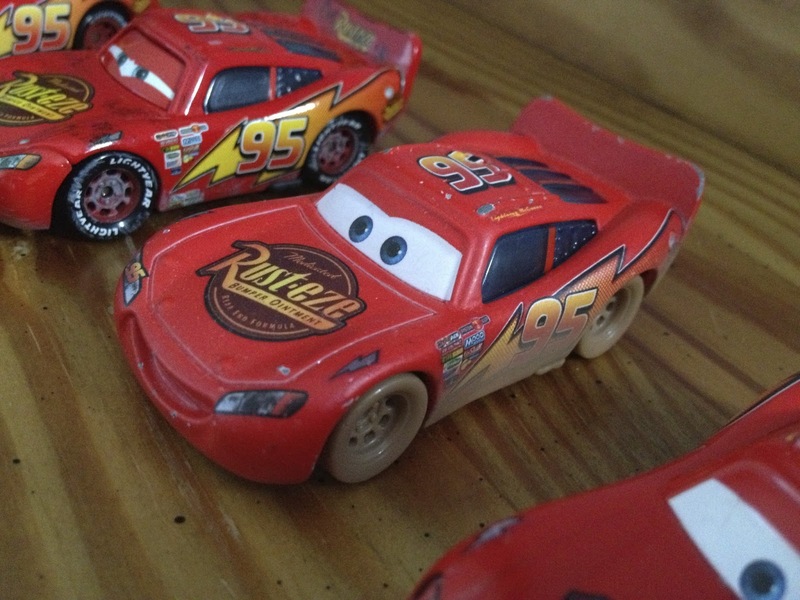 Originally available in 2008/2009 (in the Race O Rama series), Frank has become one of the most rare (and most expensive) of the Cars characters to track down- until now. Over the last few years, Frank was typically being sold for anywhere around $75-$100 online (sometimes even more)- a price I wasn't willing to fork over. I'm thrilled he's available once again for us collectors who missed him the first time around. While I did get a plastic Mattel Frank in the Toys R Us "Tractor Tippin'" track set a couple years back (seen HERE), this diecast version is so much more detailed and, frankly (did you catch that? ), a lot cooler. As usual, Frank here is 1:55 in scale and is from Mattel. 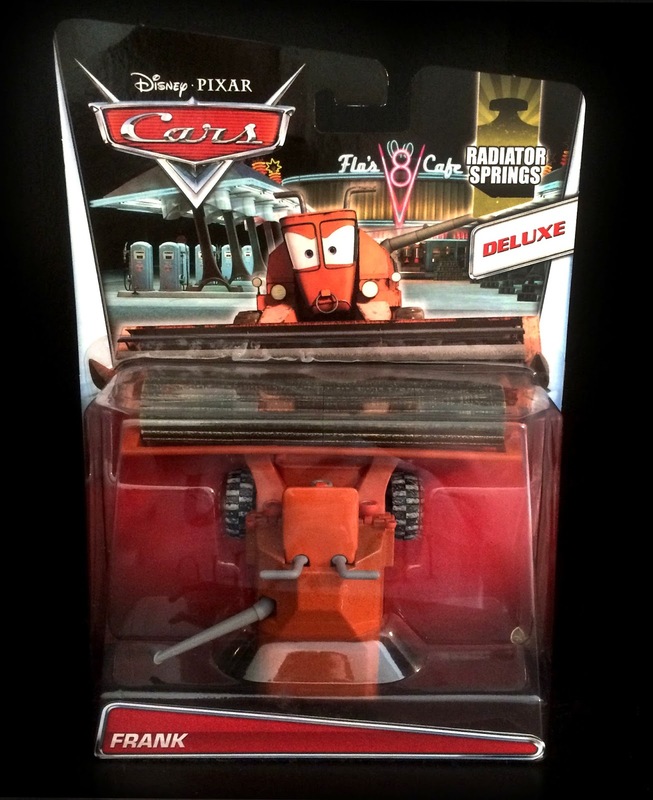 This release is #6/19 of the 2015 "Radiator Springs" sub-series and is "Deluxe", or "Mega", size vehicle. Find Frank in stores now! Or, if you're having trouble tracking him down, visit this direct link to eBay HERE or Amazon using the link below. 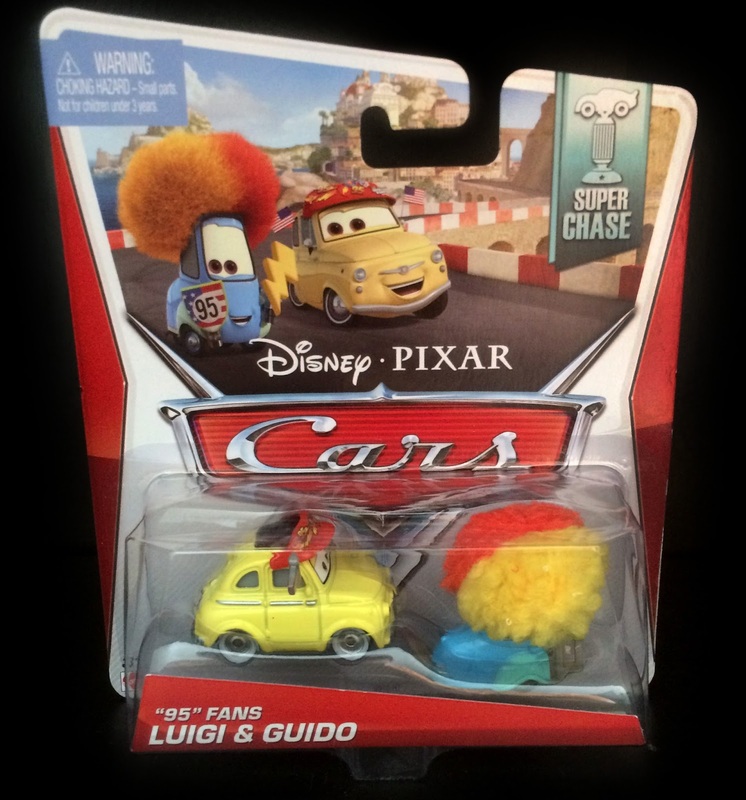 From Cars 2, here we have another "super" exciting new addition to my collection..."95" Fans Luigi & Guido! The reason this is such a cool 2-pack is because this is a "Super Chase" release, which basically just means it's ultra rare (no more than 4,000 units are produced). 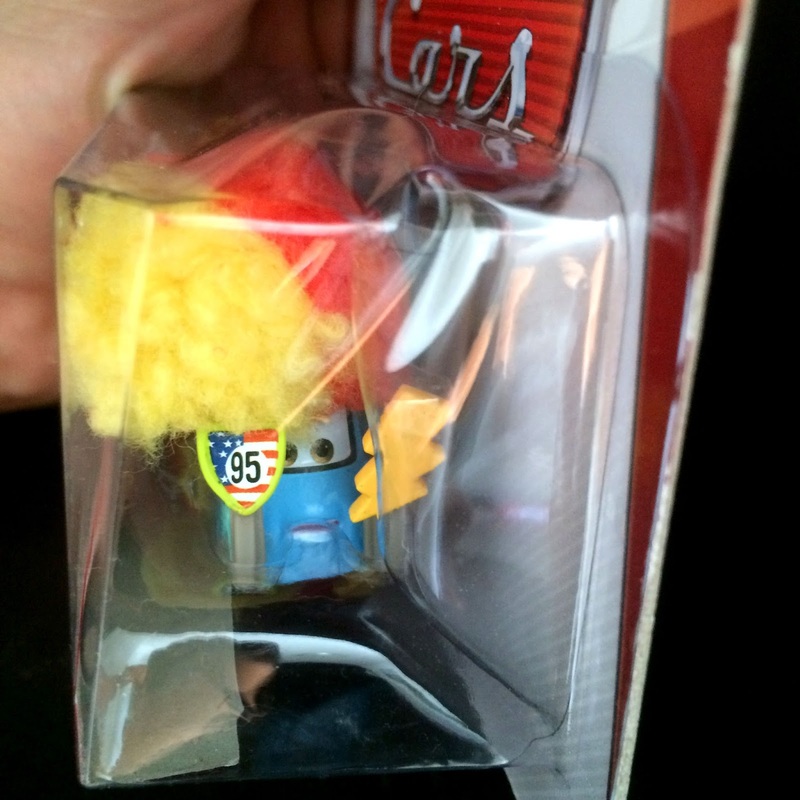 Super Chase cars are extremely difficult to spot in stores, so I'm thrilled to have finally found this one! This pack was released in late 2014 and, per usual, are 1:55 scale diecasts from Mattel. 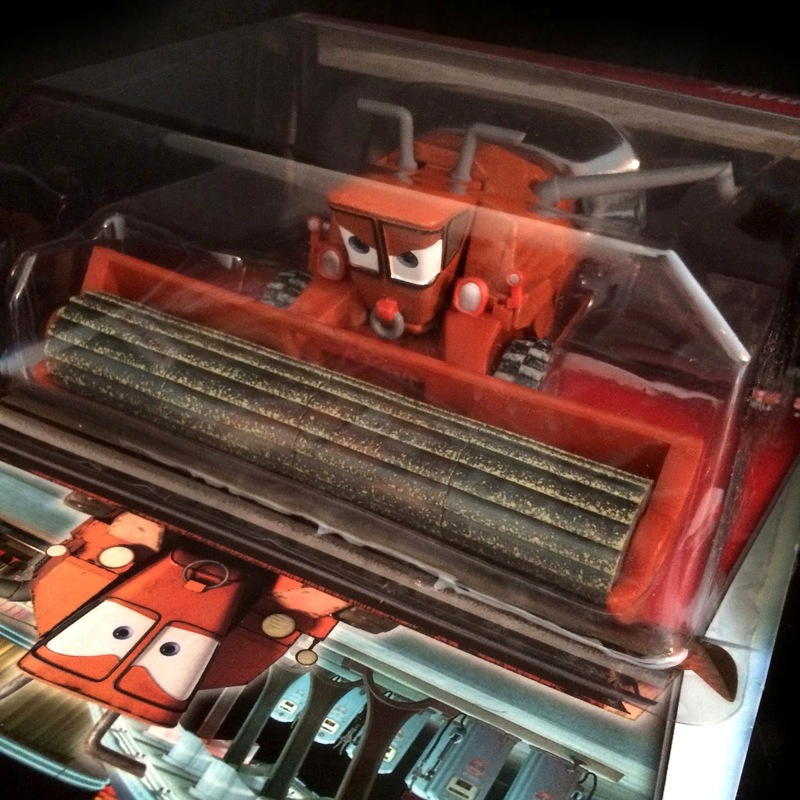 As shown in the screen shot above, Luigi and Guido appear this way at the end of the film- cheering on Team Mcqueen during the Radiator Springs Grand Prix. If you're interested in the other Super Chase cars out there, check out my other posts on Yukio, Hiroaki, Takeshi, Carateka and Trike Feldman. Look for a few more here in the coming days as well! 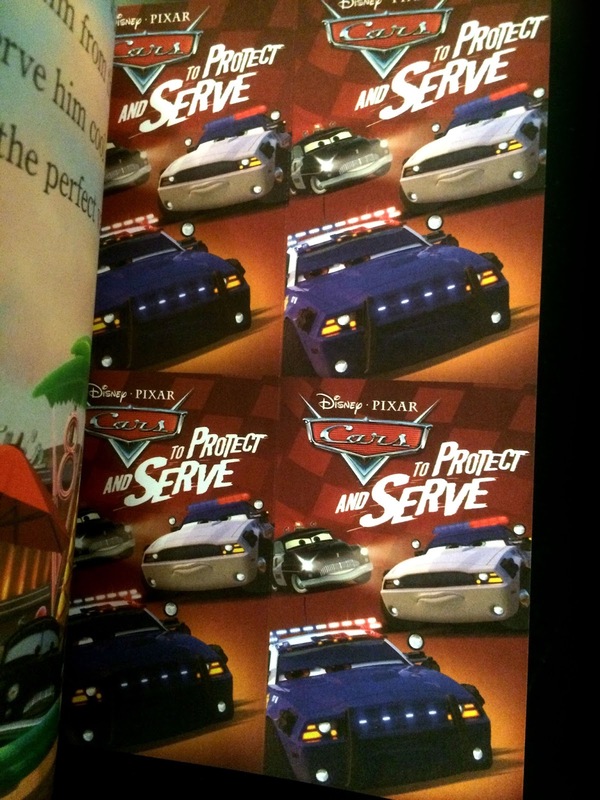 On January 6th of this year, Random House and Disney·Pixar released a brand new "Step Into Reading" book based on the upcoming Cars Toon, To Protect and Serve! This book is a "Step 2" reading level, which means it's best for "Reading with Help, Preschool-Grade 1." 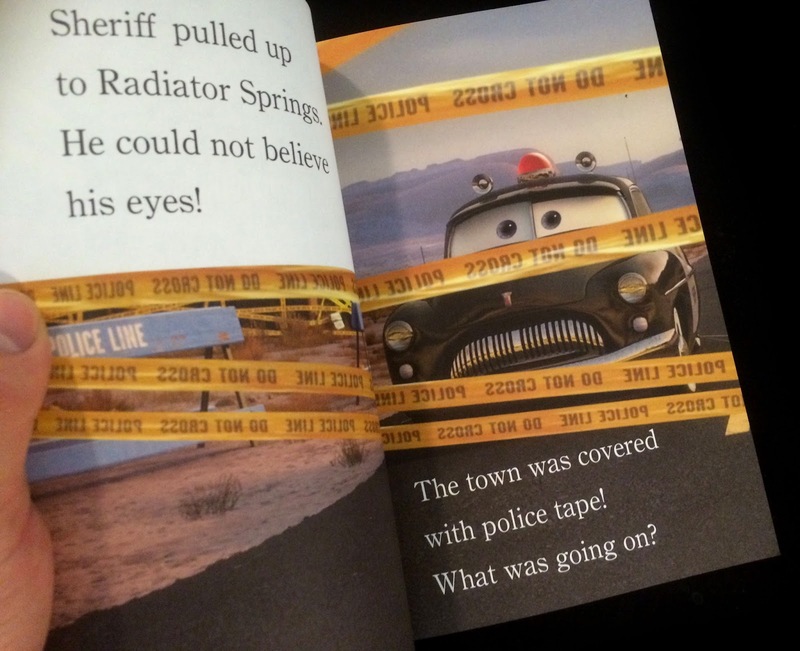 It's a very cute story, very simply written for young kids. Since the Toon hasn't been released yet, this is a great teaser for what's to come without spoiling too much. 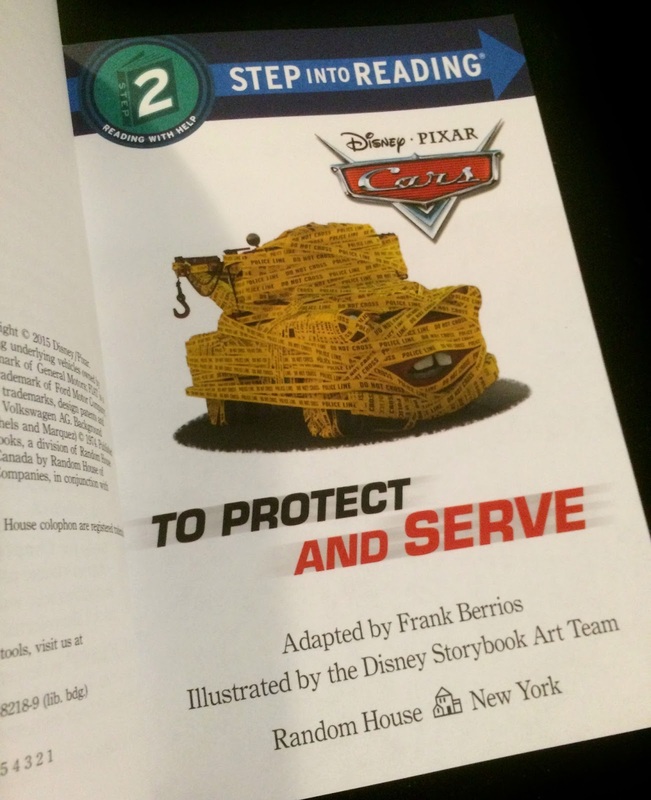 This adaptation is written by Frank Berrios, illustrated by the Disney Storybook Art Team (though it looks like screen shots from the film), is 21 pages long and includes two pages of 16 tear-out "game cards." 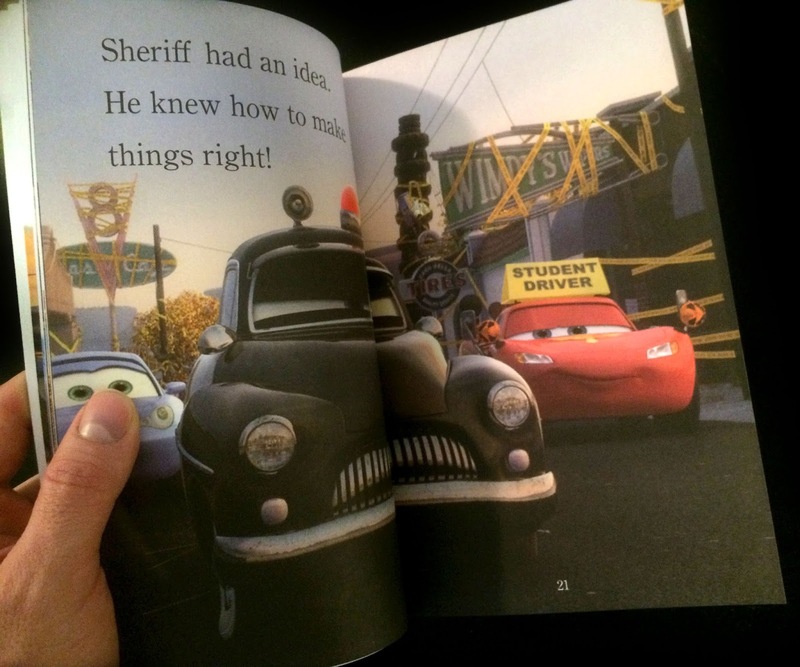 When Sheriff takes a mandatory vacation, two overzealous rookies from County [Didi - 05 and Mike 07] take over his duties in Radiator Springs. 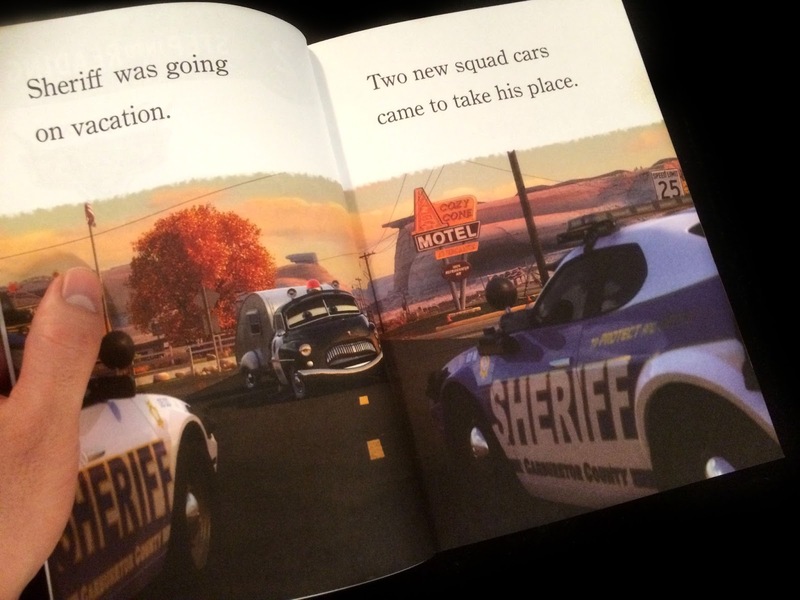 Bent on making a good impression to score commendations, the rookies over-do every aspect of their jobs, finding “crimes” at every turn and turning the quiet little town into a hotbed of taped-off crime scenes. No one is safe and everyone’s a suspect until Sheriff senses an imbalance and returns home to right the “justice” that’s been served. While there is no specific released date yet for this Toon, it will be released sometime during 2015. It's a pretty long time coming, as it was announced at the 2013 D23 Expo! 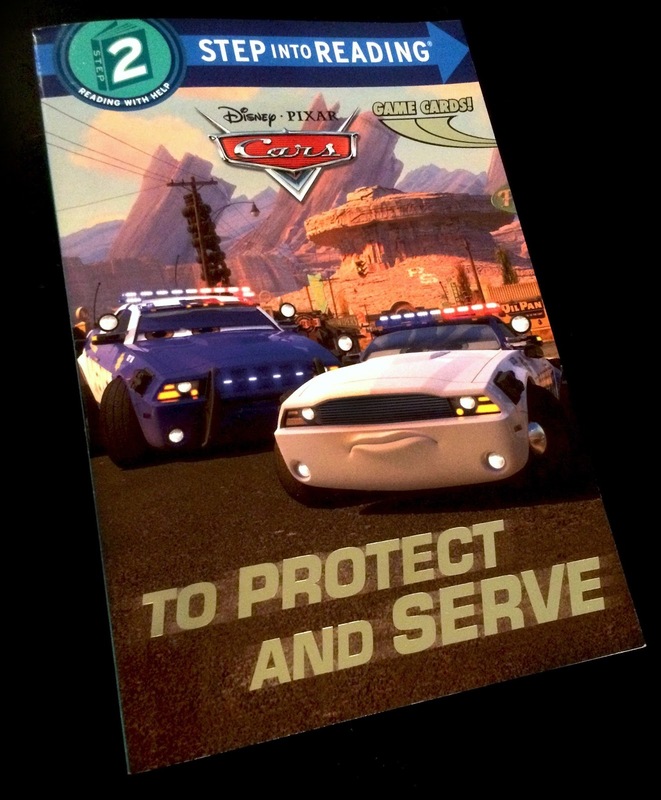 For more info, visit my friends over at PixarPost.com (who had the exclusive first look). I can't wait for this one to come out, the story and characters seem totally hilarious! If you're looking to pick up this book for your collection, visit Amazon using the direct link below. 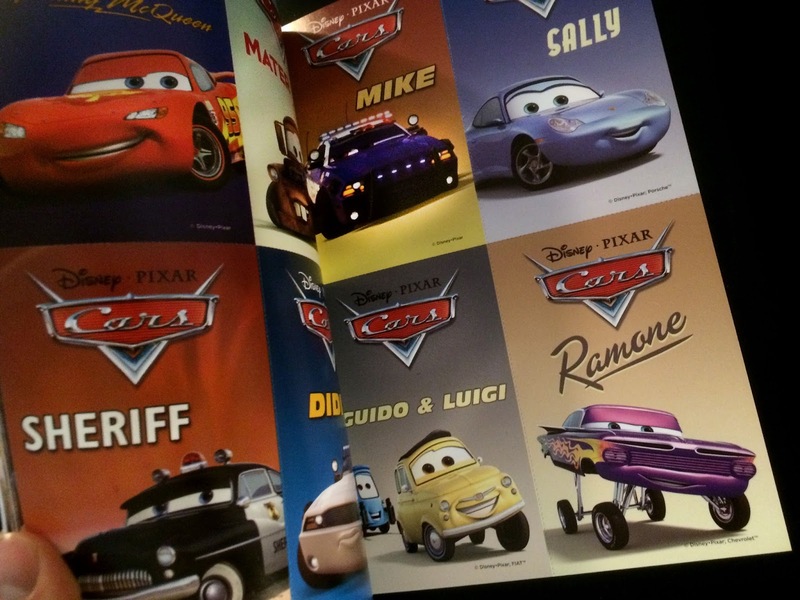 Highly recommended for young (and the young at heart) Cars fans! 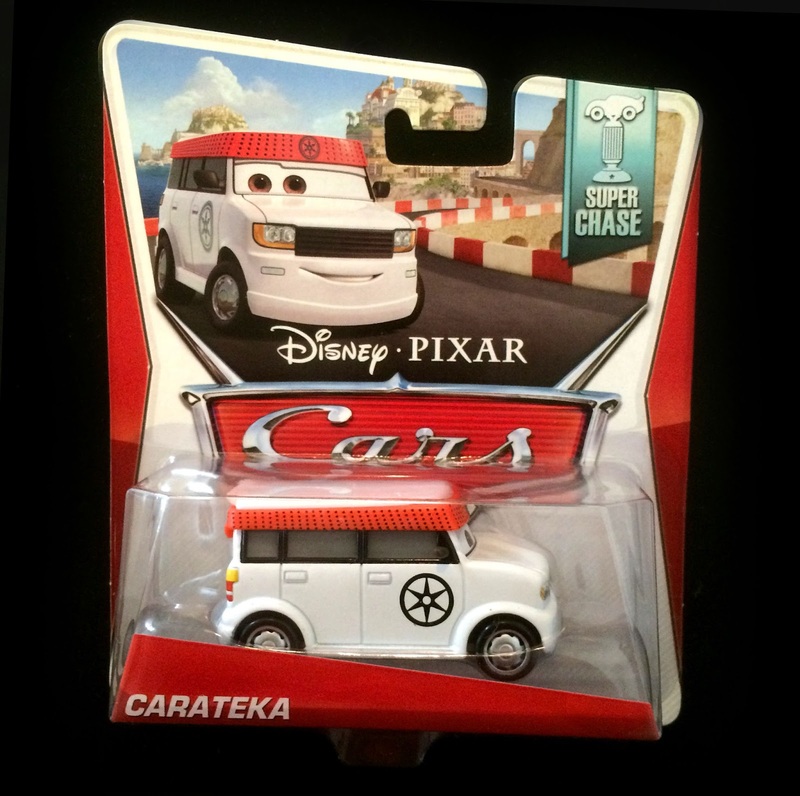 From Cars 2, here we have a "super" exciting new addition to my collection...Carateka! The reason this is such a cool car is because he's a "Super Chase", which basically just means he's ultra rare (no more than 4,000 units are produced). 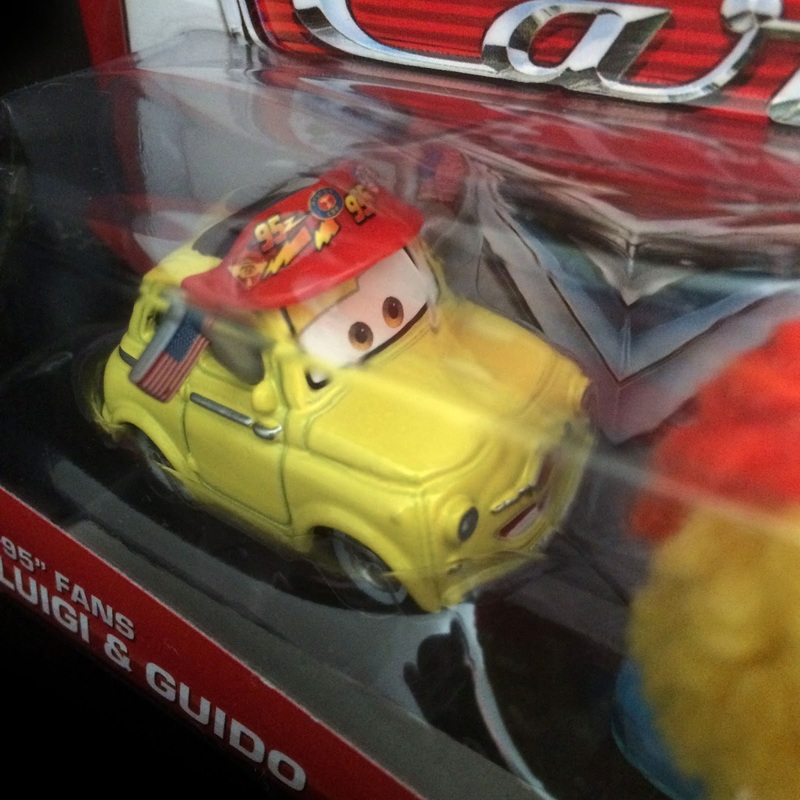 Super Chase cars are extremely difficult to spot in stores, so I'm thrilled to have this one! Per usual, this is a 1:55 scale diecast from Mattel and was released late in 2014. As shown in the screen shot above, Carateka is one of the of the vans coming out of the Karate dojo (cleverly named "Carate" in the World of Cars) after Finn has his street fight with the attacking Lemons. If you're interested in the other Super Chase cars out there, check out my other posts on Yukio, Hiroaki, Takeshi and Trike Feldman. Look for a few more here in the coming days as well! If you're still looking hard for Carateka, but never found him in stores, be sure to hit up eBay HERE or Amazon using the direct link below. Good luck on the hunt! 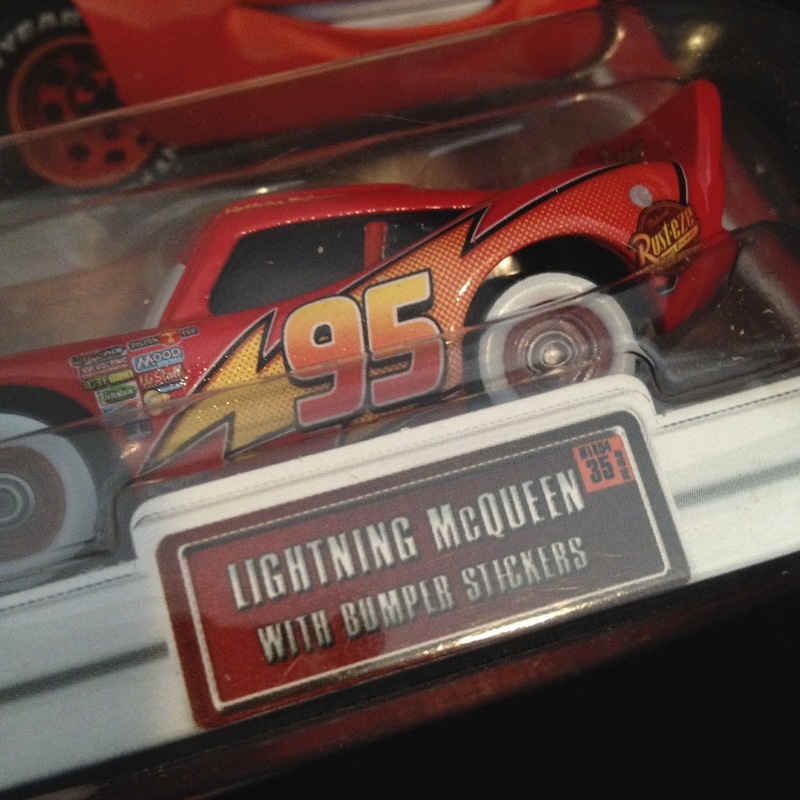 Here's a 2007 Disney·Pixar Cars release, Lightning Mcqueen with Bumper Stickers! 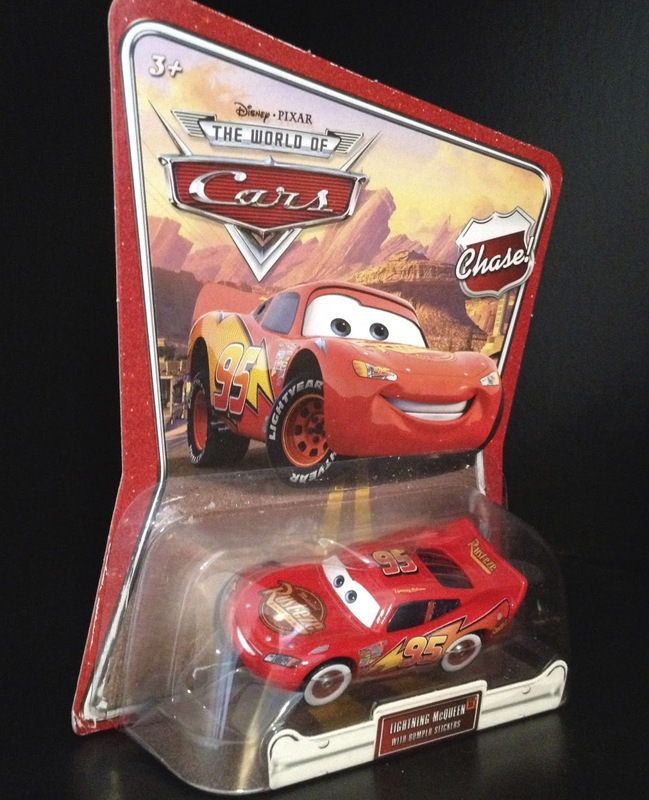 This version of Mcqueen was only released this once in the "World of Cars" line and is a "chase" edition (meaning fewer quantities were made). As usual, this is a 1:55 scale diecast from Mattel. 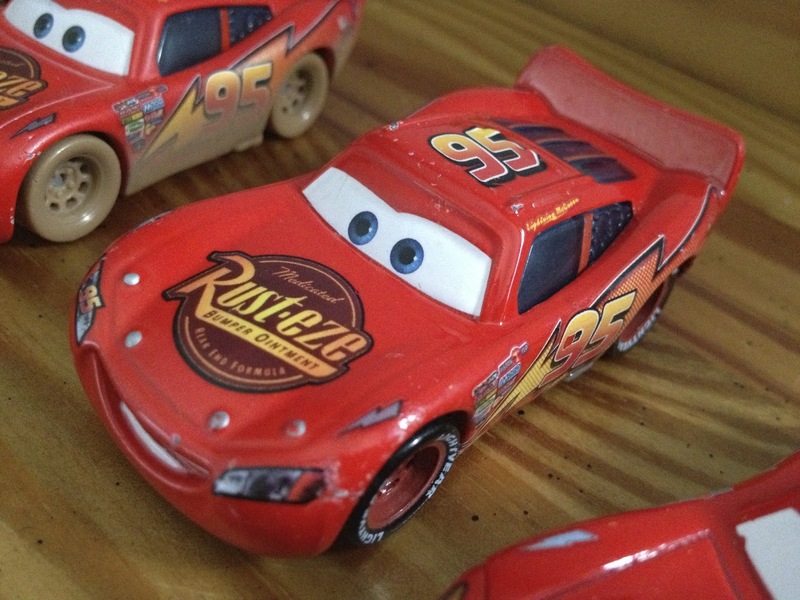 As shown in the screen shots above, this diecast is based off the "Route 66" montage scene in Radiator Springs when Lizzie slaps some bumper stickers on Mcqueen. Other than the small, subtle "stickers" here on Mcqueen's bumper, this diecast is pretty much the same as the standard "White Walls" Mcqueen release (which will be shown here soon as well). 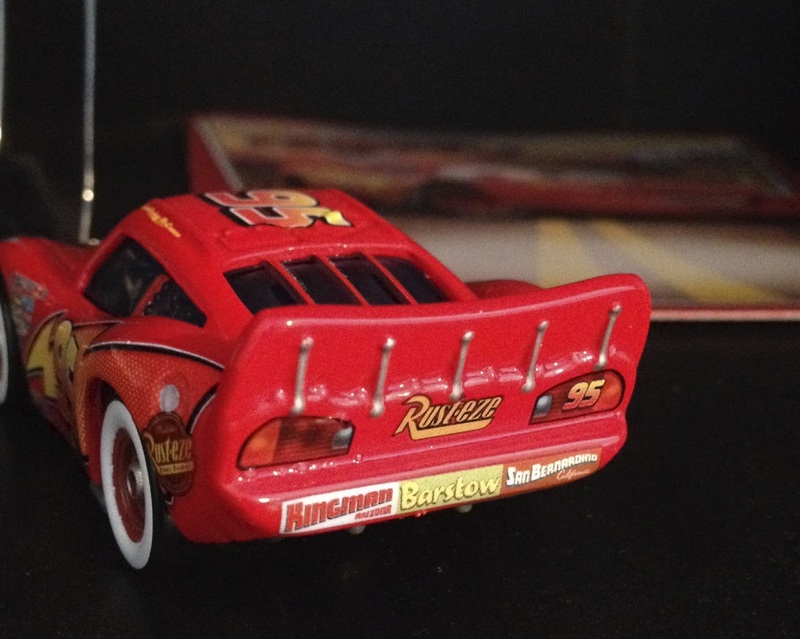 From Mattel, here we have last year's re-release of Hudson Hornet Piston Cup Lightning Mcqueen! This is a 1:55 scale diecast and is #1/9 of the 2014 "Mel Dorado Show" sub-series. 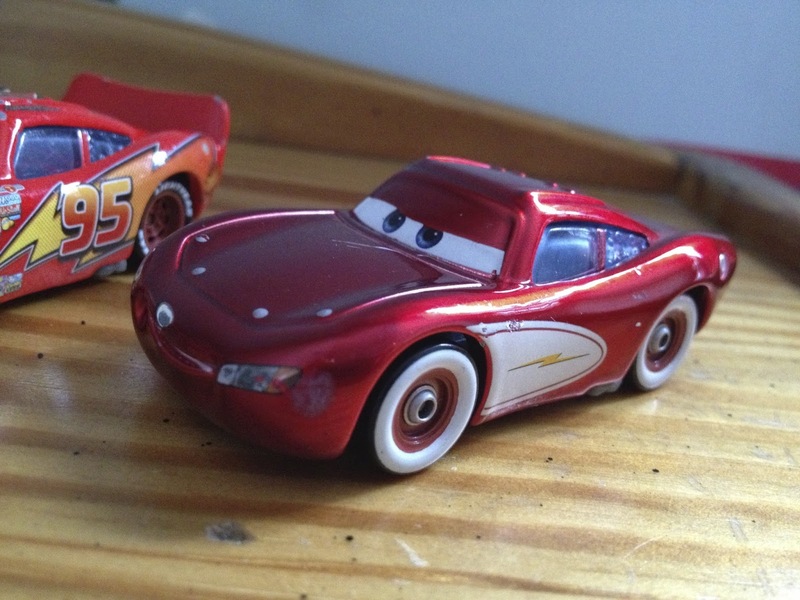 This version of Mcqueen was originally available in the initial Cars 2 line (#26), but I had missed it the first time around. 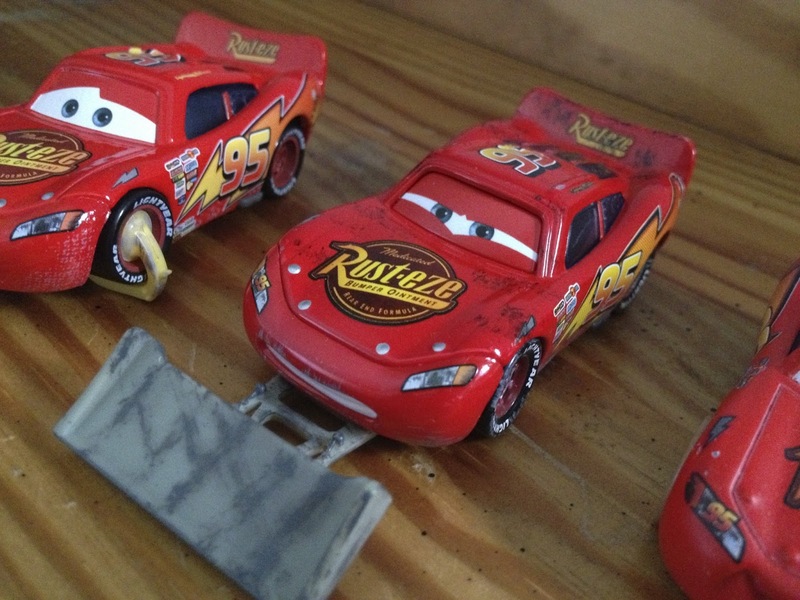 As shown in the screen shot above, this is how Lightning Mcqueen appears at the very beginning of Cars 2 (before he gets his WGP paint job and real headlights). 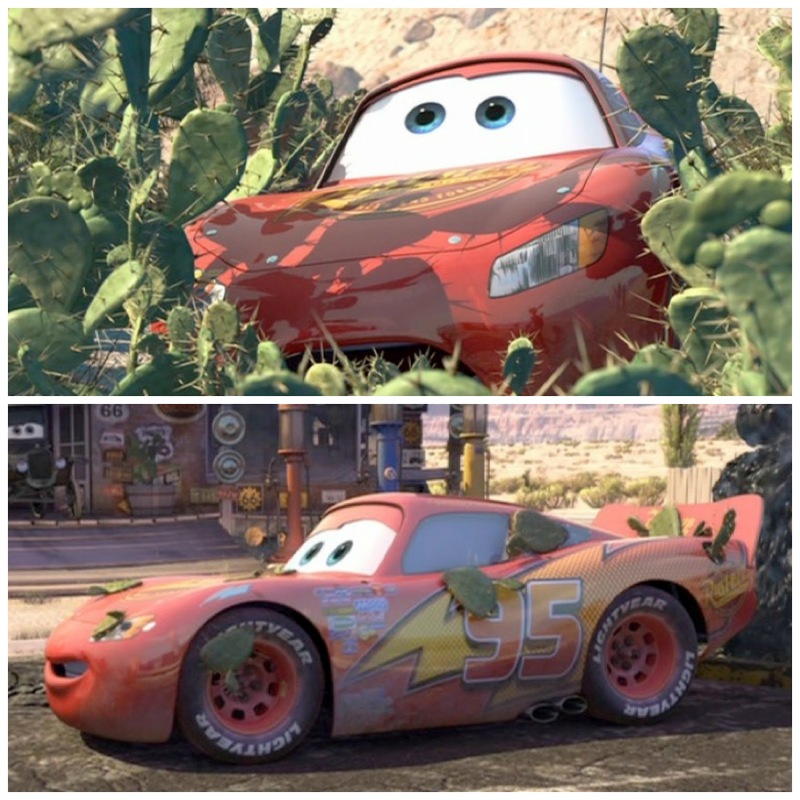 Here we have the Disney·Pixar Mattel 1:55 scale diecast of Cactus Lightning Mcqueen! 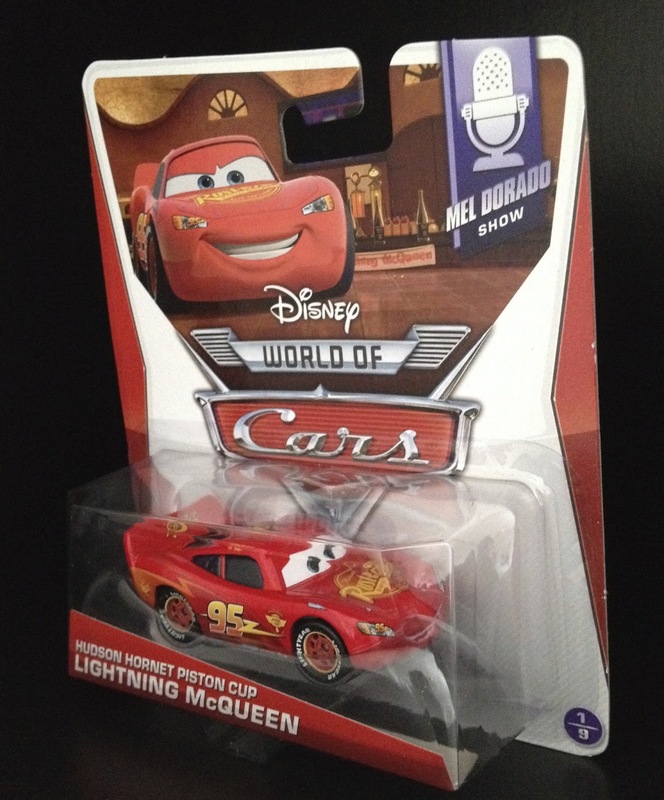 This re-release is #1/5 of the 2013 "Lightning Mcqueen" sub-line from a couple years back. 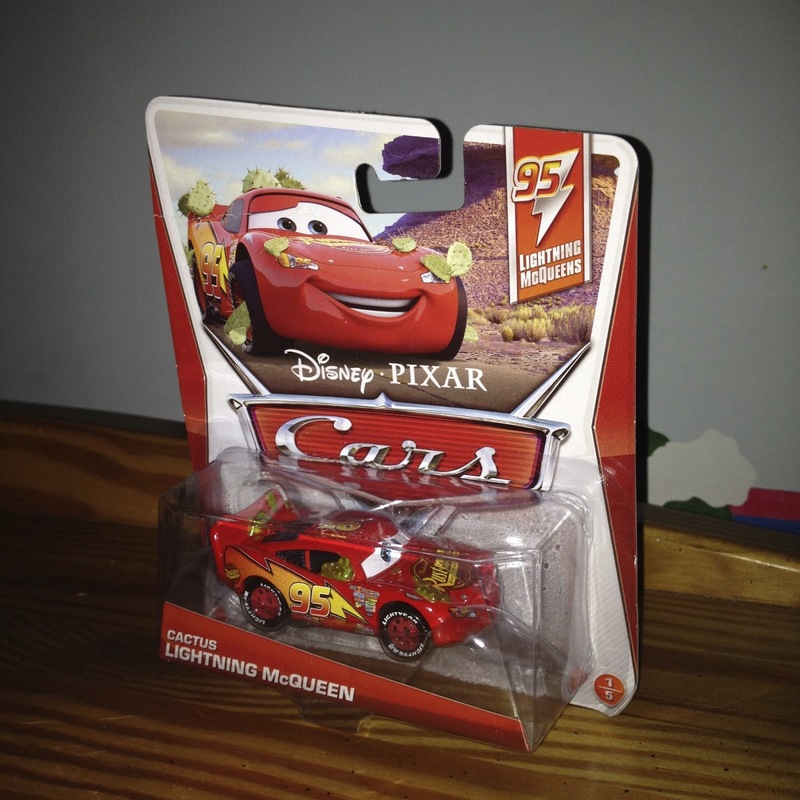 Before this release, this version of Mcqueen had been released in multiple series, such as the "Race O Rama" and the "World of Cars" series. I was really happy to see this one show up in stores again, since I had missed it the first couple times around. Look for more Mcqueens right here soon! 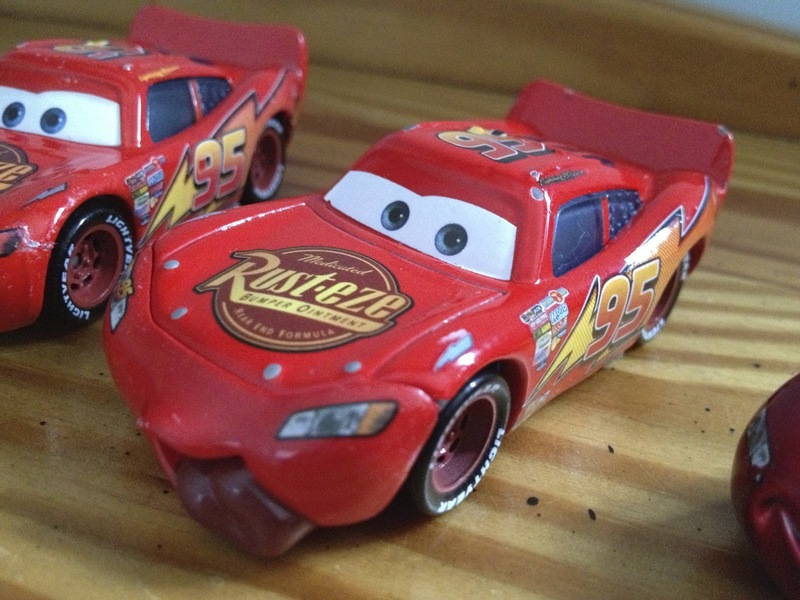 Lightning Mcqueen, without a doubt, has had more diecast versions released of him then any other character in the Cars franchise. I've posted quite a few already on here over the years, but in the next few weeks, you'll be seeing a lot more (somewhere around 12, in addition to these). To start things off, here we have six loose Mcqueens, from various series since the Mattel 1:55 scale line began in 2006. These are some of my older ones, hence why they're loose. You might be thinking, how many versions of Mcqueen could they possibly make? Oh...there's many more to come (plus the 10+ I've already previously posted here). I haven't made an exact count yet, but I know I have over 30 versions (and there are plenty I don't have as well). Once I'm done posting them all here, I'll link to every single one I have in the final post- then we'll know for sure. I enjoy the many different versions of Mcqueen out there- they're great for scene/diorama building, which I like to do. Check back right here soon for more! 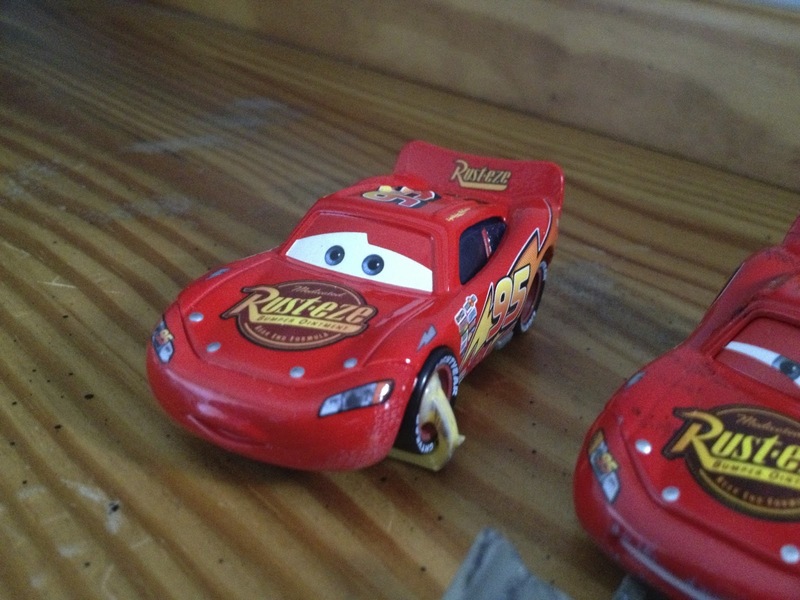 In the mean time, feel free to explore the rest of my Cars/Cars 2 collection using the label to the right. Here's a great book I got a while back- The Pixar Touch: The Making of a Company by author David A. Price. I recently realized that I had never documented it here on the blog, so here it is! "It Seemed Like and All-Out War"
All in all, this is a pretty definitive [and honest] look at the creation of Pixar from the early beginnings of the company up through the production of Wall·E. The trials and hardships that the founders (and other employees) experienced are documented as well as their inspiring successes. There are some really fantastic details, little-known facts and insights into the company here in this book that you don't get by just watching the few Pixar documentaries out there. It's absolutely a must have for Pixar fans! The book retails for about $15 and is 274 pages long (310 with the Index). Order your copy below on Amazon. 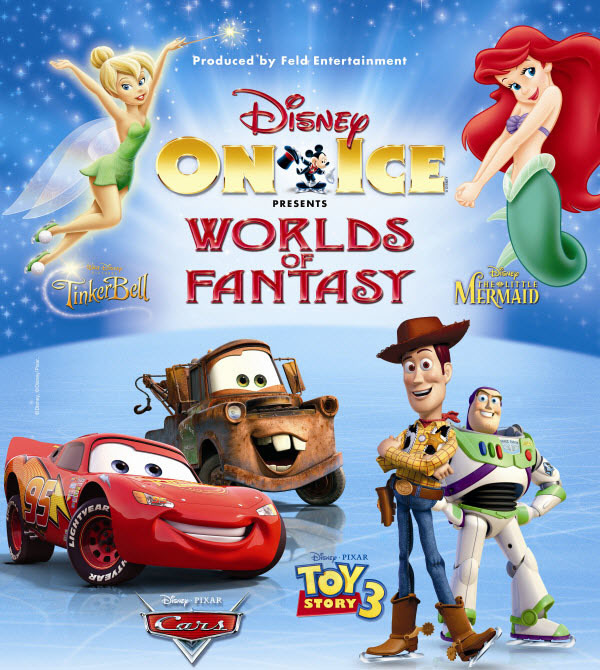 On January 4th, 2013, we headed out for a night of Disney·Pixar magic and fun at the Webster Bank Arena near our home in Stratford, CT. Any time Disney On Ice comes to town, its always been a tradition to go, ever since I saw the original Toy Story on Ice with my dad back in 1996. 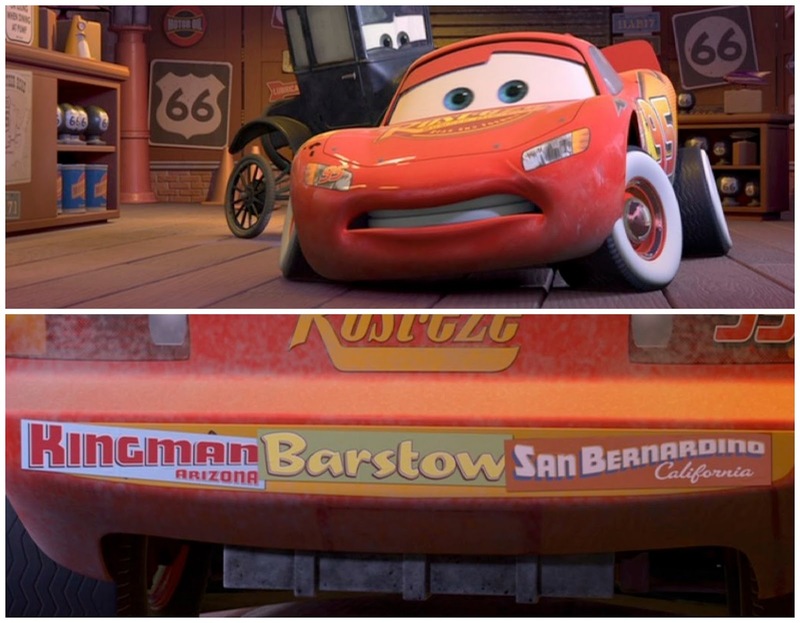 I was really excited for this one, since it's not as common to have Pixar represented on ice- and this one had both Toy Story 3 and Cars in the mix, both of which I had never seen! Plus, there was the exclusive merchandise I was also excited for. The coolest thing I bought there was the rare and sought after Disney On Ice Lenny the binoculars (seen HERE). I had no idea it would be there, so that was an amazing find! The Cars portion was probably the shortest, with Mater, Lightning Mcqueen, Sally, Ramone and Flo coming out for just a few minutes on the ice. No story was told here, mostly just driving around (with a little bit of dialogue/chitter-chatter between the characters) to a song that was playing. It was pretty cool though seeing them all out there though since I love these characters! Toy Story 3 was the longest segment during the show, taking up probably a full 30 minutes going through the main scenes of the entire film. The show ended with this one and the classic Disney characters joined the Toy Story cast for the finale. Yah, admittedly it was a bit cheesy at times (the show's main target is young kids after all), but overall it was a really fun time! And of course the ice skaters were very impressive to watch as always- especially Barbie and Ken's bit. This show is still running, so if you have a chance to take your kids to it if it comes to a town near you, I'd recommend it! The kids will absolutely love it and you'll have a great time as well.